The Kigali Amendment on hydrofluorocarbons (HFCs) is excellent news for the climate. It tackles a powerful greenhouse gas, binds parties to take action with more teeth than the Paris Agreement, and demonstrates again our international capacity to cooperate. This Amendment looks to be the largest single action that will deliver on the pledges in the Paris Agreement. However, the climate change benefits are unlikely to significantly supplement those of the Paris Agreement and deliver the widely reported “high hopes” of an additional 0.5°C of avoided warming. Here’s the source of the high hopes. Many have cited one study that estimates that HFCs could increase temperature change by as much as 0.5°C. So, as many have asked us here at Climate Interactive, can we now revise the temperature estimates resulting from the Paris Agreement? Lack of sufficient additionality. Actions to reduce HFCs were already included in many national contributions (INDCs) from major emitters to the Paris Agreement, so have in part already been accounted for in temperature assessments. The U.S., for example, plans to meet its INDC of 26-28% below 2005 levels by 2025 by taking federal action on HFCs. The U.S. INDC includes all greenhouse gases, including HFCs, and among the actions the U.S. is taking to meet its INDCs it details that “the United States Environmental Protection Agency is moving to reduce the use and emissions of high-GWP HFCs.” And the EU, in its biennial report to the UNFCCC has also explained that they are reducing HFC emissions as part of actions to fulfill its INDC. Avoiding HFC emissions in developing countries such as China and India, which would happen later in the century and thus have less of a temperature impact, would be additional to the Paris Agreement since those countries have not already pledged reductions of non-CO2 gas emissions. Estimate of temperature impact outside the bounds of IPCC studies. The idea that reducing HFCs could have 0.5°C of temperature impact comes from research by Xu et al. Their analysis stands apart from current IPCC estimates in that they assume a much higher contribution from HFCs to warming than the IPCC, and, thus, a much larger potential for reductions. The Xu et al. 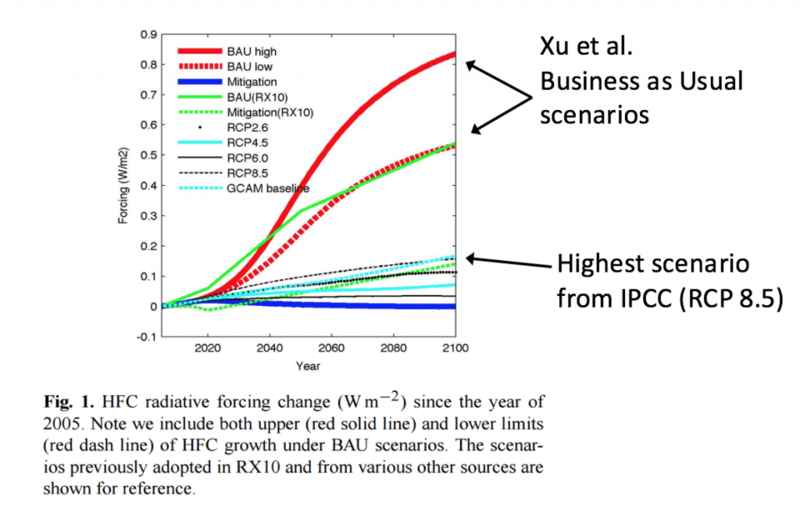 analysis assumes that, if we take no action, radiative forcing from HFCs would be over four times as much as the highest-emissions IPCC scenario (RCP 8.5, see figure 1). They estimate that net radiative forcing from HFCs by 2100 would be ~.68 w/m2 (mid point of ~.84 at the high and ~.53 at the low) whereas RCP 8.5 estimates ~.15 w/m2. Put another way, because we have calibrated our simulation model, C-ROADS, against the IPCC RCP 8.5 scenario, there is not 0.5°C of warming to avoid with mitigation policies. Figure 1: Diagram from the Xu et al. paper. Notes with arrows to the right added by Climate Interactive. To claim this much reduction in warming by claiming such an inflated reference scenario is similar to the personal trainer who tells you that he helped you lose 15 pounds, but when you step on the scale, you see that you have only lost five. “But you would have gained another 10 without me,” he replies. Also note that the Xu et al. paper estimated warming as 0.35°C – 0.5°C, so the value of 0.5°C is the high end of the range, not the mean. Further, estimating 0.5°C avoided warming also assumes 100% reduction of the gases in the Amendment and 100% compliance with the Amendment, which are not realistic. So here is where we stand. Without the actions from the Paris Agreement, countries would be on course for 4.5°C, but if countries fully implement their pledges so far to the Paris Agreement – and the Kigali Amendment will help — we will reduce expected warming to 3.5°C, with possible minimal reductions from developing countries. This is still far from the Paris goal of limiting warming to well below 2.0° with an effort at 1.5°C. We’ve made progress but have further to go. Indeed, a recent article by John Vidal in the Guardian said it well: “The deal keeps the Paris agreement on track.” And Climate Analytics, who contributes to another temperature assessment of the pledges to the Paris Agreement, makes a similar point. A recent article by Warren Cornwall in Science Magazine notes that scientists now are not emphasizing the relative reduction in warming (which is so difficult for all the reasons described herein) but instead “offering a single new number: 0.06°C. That is his new estimate of how much warming HFCs will cause by 2100 if the Kigali deal hits its targets.” To make sure our C-ROADS model was correct and to benchmark our Climate Scoreboard analysis, we checked the “INDC” scenario that delivers 3.5°C warming by 2100. In that scenario, temperature increase due to HFCs is 0.05 deg C, which is within uncertainty bounds. The Kigali Amendment is important, but is no silver bullet. Instead, it is one part of the “silver buckshot” that, little by little, will help create the climate results we all want to see.